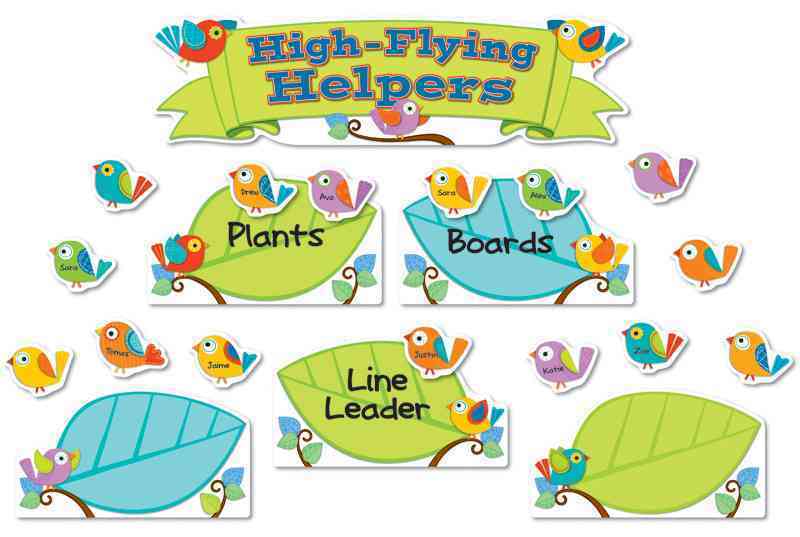 Annotation: Support the development of a harmonious classroom community with the eye-catching, contemporary Boho Birds Job Assignment Mini Bulletin Board Set. Display this functional and colorful mini bulletin board set in the classroom as a way to build and reinforce a positive work ethic in the classroom. This 41 piece set includes 30 birds, 3" x 2 1/2";10 leaf pieces, 10" x 5 1/2"; and one header, 20 1/4" x 5 1/2" and a resource guide. Boho Birds are ready to help teachers expand contemporary decorative themes into their curriculum! Color and decorations in the classroom provide a clear message to students about the environment and culture of the classroom. The eye-catching Boho Bird design helps teachers create a positive environment that promotes creativity, enthusiasm and productivity.